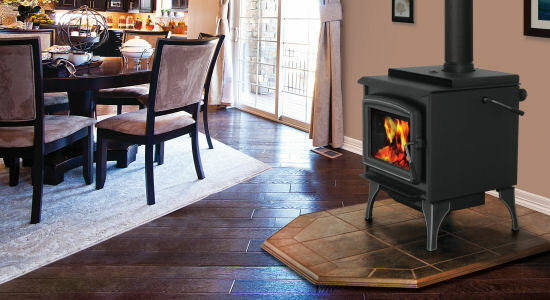 The Blaze King wood stove will keep your family warm and cozy when strong icy winds are blowing in a frosty winter. Blaze King Industries came into existence along with other wood stove companies around 1977. There was a big surge in buying wood stoves in the 70’s due to the energy crisis, consumers wanting to save money, and the desire to be closer to nature with a natural heating source. With introduction of clean wood burning regulations in Oregon in 1984, stove companies jumped on the band wagon and created wood stoves which were kind to the environment as well by crafting secondary combustion units for a cleaner and longer burn. Blaze King wood stove models have a ceramic or stainless steel honeycomb catalytic combustion system which met all of these requirements in making the most of natural heat and completely using the available resources with a complete burn. Old fashion values stand strong with these pioneers and they commit themselves not only to clean air and highest efficiencies, but to overall safety and excellent craftsmanship in wood stoves as well. 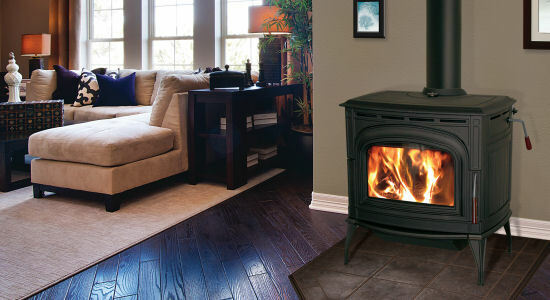 We’ll briefly investigate the main features of different models of Blaze King wood stoves. The “King” is the grand daddy of all catalytic wood stoves and can burn up to 40 hours long on a single load of hardwood. It is capable of heating up to 3000 square feet and can hold several logs at the same time which saves a lot of time and energy. The following models of wood stoves share many of the same attributes as the “King” and also feature similar catalytic combustion units and bimetal coil thermostats for nice even heating. Ashford- The Ashford 30 comes with a cast iron body and is available with different finishes including painted black, colonial pewter and brown enamel. The large fire box can accept logs up to 18 inches and has a good burning time of approximately 30 hours when the thermostat is set on low. It is capable of heating up to 2,400 square feet depending on the wood type and construction of its location. The Ashford 20 model is a little smaller, but offers the same beautiful styling and finishes as the Ashford 30. It can heat up to 1500 square feet with an estimated burn time of 20 hours when set on low. The maximum log length for the Ashford 20 is 16 inches. Both are beautifully styled and have an ash pan which glides out (mounted on technically engineered runners) for easy access to ashes, and removal. Sirocco- The Sirocco 30 is a large catalytic wood burning stove and can heat up to 2,400 square feet in a well insulated home. It holds a fire well, accepts logs up to 18 inches long, and can burn up to 30 hours when the bimetal coil thermostat is set on low. The burn time is estimated using hardwood as the fuel source. The Sirocco 20 has the same features as the Sirocco 30, but is a little smaller and accepts logs of up to 16 inches in length. It is capable of heating up to 1,500 feet. This stove is placed in the medium size wood stove classification. All of the Blaze King wood stoves can heat a fairly large area and have a good burn time. Chinook- The Chinook 30 is in the large wood stove category and accepts log lengths up to 18 inches. It can easily heat up to 2,400 square feet. Just like the other wood stoves in the Blaze King line it has a secondary catalytic burn unit which burns all of the wood for complete efficiency and warmth. The Chinook is thermostatically controlled and has a long burn time of up 30 hours when it is set on low. It also comes in a medium size, the Chinook 20, which can heat up to 1,500 feet in idealistic conditions. The Blaze King wood stove is solidly constructed and has a variety of styling and design options. There is one major factor which could influence your wood stove buying choice, and that would be the catalytic combustion unit. Many do not care for the catalytic combustion unit system because it can degrade over a period of time, requires maintenance, and sometimes costly replacement. The replacement part usually runs around $200. Blaze King does offer a 10-year 100% no fault warranty on the original combustor that comes with the stove. 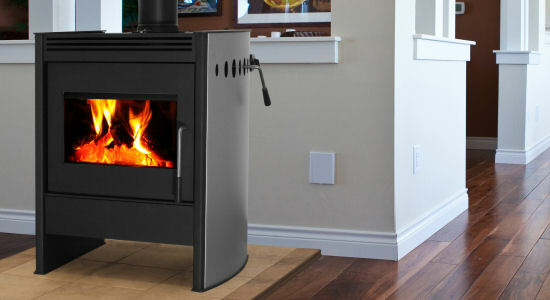 A lot of wood stove makers have chosen to use a non-catalytic secondary combustion source, or design, which uses little miniature holes on the top of the firebox, or in a tube running across the firebox, in preference to the catalytic combustion design. 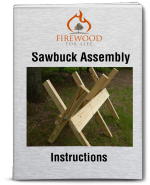 Both do an excellent job of complete burning of all of your wood with very little creosote build up and harmful contaminates being released into the environment. All in all Blaze King produces a very well made and capable wood stove which is an excellent choice for all of your heating needs.